Recorded in a marathon one-day session at the Nevada City home of co-producer David Paulson, Up From Mo's features Stephen Yerkey solo on acoustic guitar and harmonica. "Some of Steve's songs and stories were still so fresh (not to mention lengthy and full of twists and turns) that he'd written the lyrics on pieces of paper, which he taped to the backs of chairs in a semi-circle all around him. As the words poured, spilling tales of railroad workers and kneeling buses and brightly colored Cadillacs, his face remained buried beneath that wall of white, the only visible tidbits being his tall chestnut-brown coif, the occasional glint from his eyeglasses and the blur of his busy strumming arm. Steve's voice is an incredible instrument- at moments it's mangy and untamed, elsewhere it grows soft and delicate, but either way, you never feel it's out of his control. From song to song, he slid that baritone up and down the verses, wrapping it aroung the words and giving them a chew, squeezing the juice from every sound and syllable. In "Up From Mo's," he spat out references to short pants, butterfingers, and Ron Nagle's solo album Bad Rice, a forgotten glimmer from the Bay Area's musical past. In "We Don't Get To Watch The Trains," his mood felt more soothing, even thought the song's subject (railroads and dynamite, robber barons and white-collar criminals) was no less intense. "Broadway Wanderer" came out ripe and raw while "Those Of Us Who Love Our Wives" weaved anguished yelps, tired cries and tiny sweet timeless moments into a ragged portrait of love and dedication. The words of theseand other songs spilled out into the room in thick mouthfuls- no wonder he needed them taped onto those chairs. At day's end over a dozed songs were laid down and good to go. And it's all here, no fancy tricks or studio shenanigans- what you hear is what we heard. Steve's gentle guitar, his sputtering harmonica, and his amazingly versatile voice, at some points loud enough to wake the neighbors, other times so gentle you find your head moving closer to the speakers, seeking every nuance. As evening fell, I drove east to Marysville which was a curious twist, since one of the last songs Steve cut that day was "Marysville," a song that mingles the multilayered memories and stories of a family's westward migration. The town itself had little excitement to offer besides a walk around the Bok Kai temple and a beer and burger at the Silver Dollar Saloon. But it was a moment that even today I can't seem to shake- all those melodies, characters, historic images, and nitpicking details were still echoing fresh in my head, in the dark, rainy night of a near-silent Marysville. It had been an odd experience, after all, watching and listening as that strange, wild world of Steve Yerkey unfolded in a place as as plain and everyday as a neighbor's living room. But it's an experience that comes flying back, pungent and colorful, every time I play this humble album. "I used to drive to work past Cape Horn-this big canyon-near Colfax. I always loved it there. It's really beautiful. They used to run the Central Pacific Railroad around the cliff. Now the railroad runs through there. I knew there was a lot of history connected with the railroad. I read a book about the Transcontinental Railway and the Chinese who worked on the railroad-they came up with the technology to use dynamite to make the roadway. California was built by Mexicans and by Asian people. It was built by white people, too, but also exploited by white people and when I wrote the song, I wanted people to know that." Once called "the Elvis Costello of country," Stephen Yerkey's musical amalgam Americana combines elements of alternative rock, country, and jazz with the quirkiness of Tom Waits and the deceptive simplicity of Johnny Cash. Yerkey has successfully molded his own individual style of masterful roots rock. Yerkey's eccentric West Virginia-born baritone matches his bold, original music like a loud suit. His songs shine in the best traditions of American music while veering wildly from barfly brawler to cowboy lullaby. His definitive 1995 album Confidence, Man reveals the darker recesses of Yerkey's soul as well as his tried and true country heart. A nomadic graduate of the school of hard knocks, this evocative artist surprises and amazes with his narrative - songs like "Cocksucking Blonde" and "Maker's Mark" vividly evoke the grittiness of his experiences here in San Francisco and elsewhere. 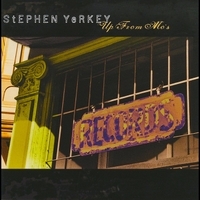 Yerkey's latest work, the 2003 album Up From Mo's, is equally stunning and complex, spilling tales of railroad workers and robber barons, short pants and kneeling buses, butterfingers and brightly colored Cadillacs. The depth of his songwriting is nowhere more evident than on this new album.